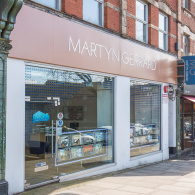 Martyn Gerrard Estate Agents in East Finchley have helped sell and let property in the area since the 1970’s. East Finchley retains its village atmosphere with a number of successful local shops and restaurants along the High Road. There is a variety of styles and age of property in East Finchley – including The Bishops Avenue with its multi-million pound property and one of the most prestigious roads in London. There are good transport links into central London and the Northern Line underground station is in zone 3. Green spaces include Cherry Tree Wood – home of the annual East Finchley festival – and Coldfall Woods.